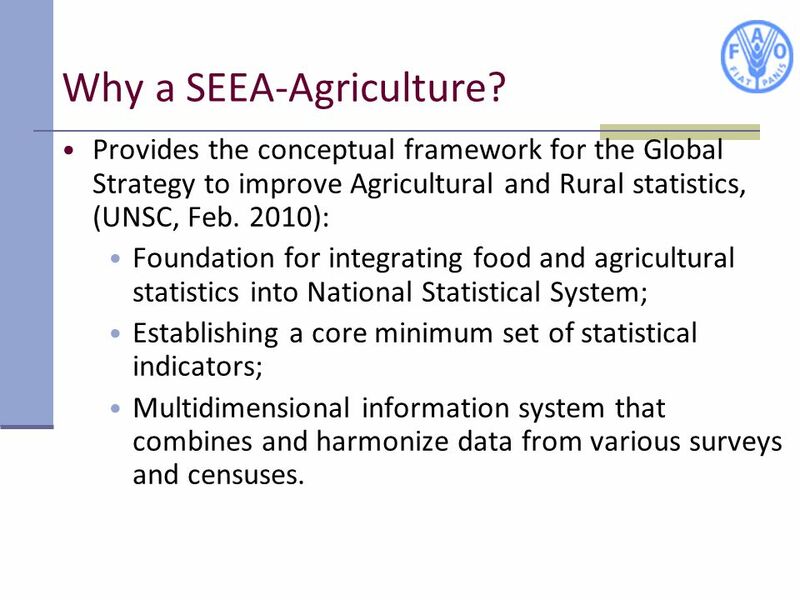 Provides the conceptual framework for the Global Strategy to improve Agricultural and Rural statistics, (UNSC, Feb. 2010): Foundation for integrating food and agricultural statistics into National Statistical System; Establishing a core minimum set of statistical indicators; Multidimensional information system that combines and harmonize data from various surveys and censuses. 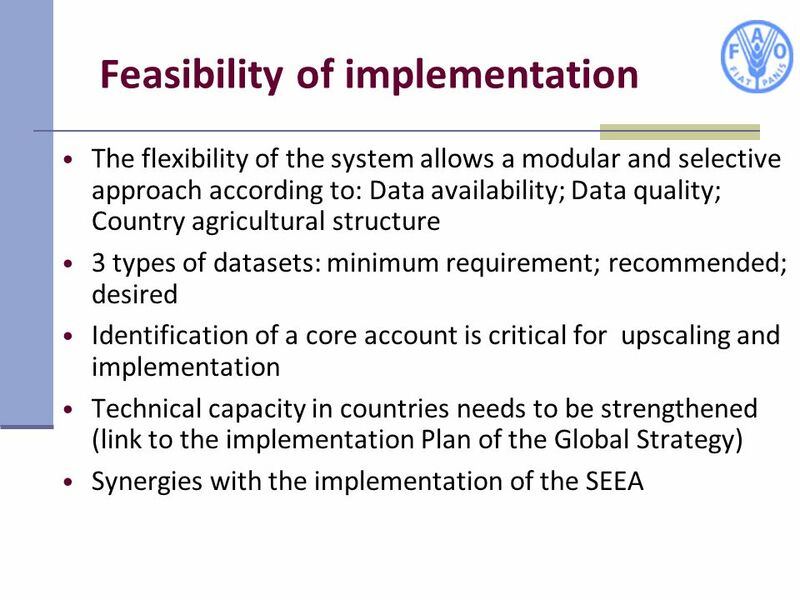 SEEA-AGRI can play an important role in GSIARS: Adopting an accounting approach for a statistical framework has the advantage of having a set of standard classifications from which consistent and comprehensive set of data series are compiled that are comparable across countries. The coherence of the data series will subsequently ensure a mutually consistent set of derived analytical indicators. The accounts can provide a complete set of variables and standard terminologies for identifying and designing a core and minimum set of agricultural indicators, all based on the standard classifications both from the SNA and the SEEA. The accounts can also be used to develop new indicators, such as environmentally-adjusted macro-aggregates which would not otherwise be available. The framework also responds to the need of having a multipurpose information system that can be used to combine and harmonize data from various surveys and censuses together into an integrated database. 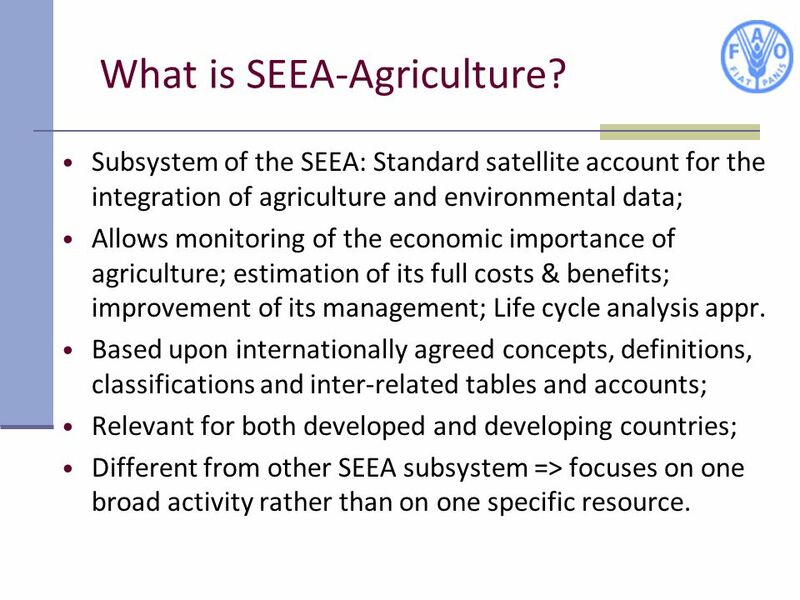 Subsystem of the SEEA: Standard satellite account for the integration of agriculture and environmental data; Allows monitoring of the economic importance of agriculture; estimation of its full costs & benefits; improvement of its management; Life cycle analysis appr. 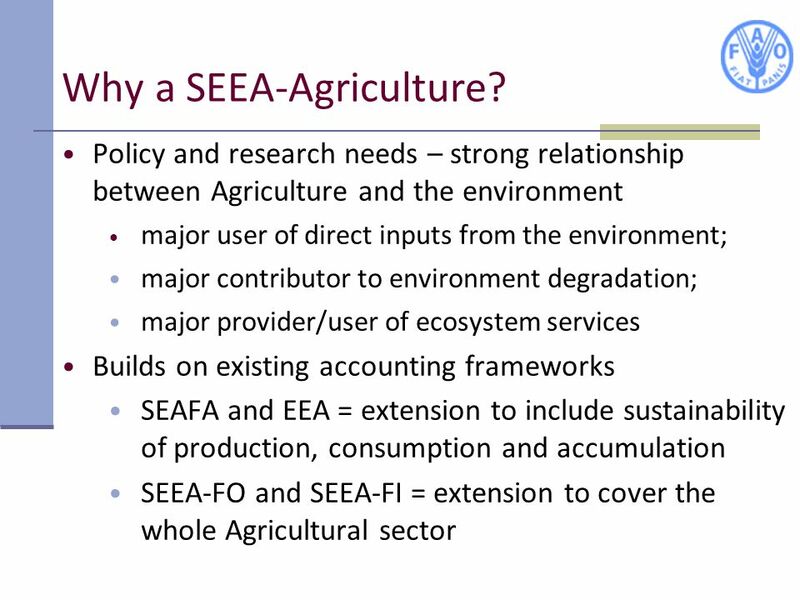 Based upon internationally agreed concepts, definitions, classifications and inter-related tables and accounts; Relevant for both developed and developing countries; Different from other SEEA subsystem => focuses on one broad activity rather than on one specific resource. Definition of Agriculture in the ISIC rev. 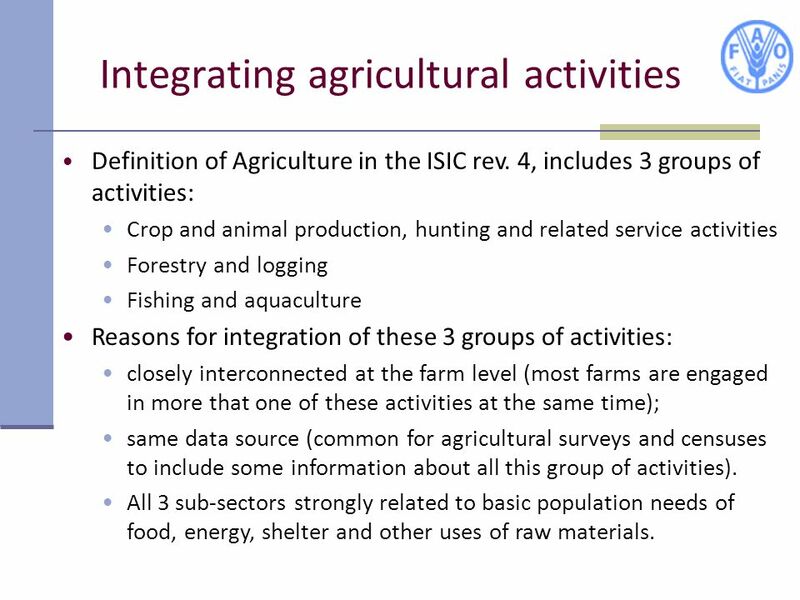 4, includes 3 groups of activities: Crop and animal production, hunting and related service activities Forestry and logging Fishing and aquaculture Reasons for integration of these 3 groups of activities: closely interconnected at the farm level (most farms are engaged in more that one of these activities at the same time); same data source (common for agricultural surveys and censuses to include some information about all this group of activities). All 3 sub-sectors strongly related to basic population needs of food, energy, shelter and other uses of raw materials. 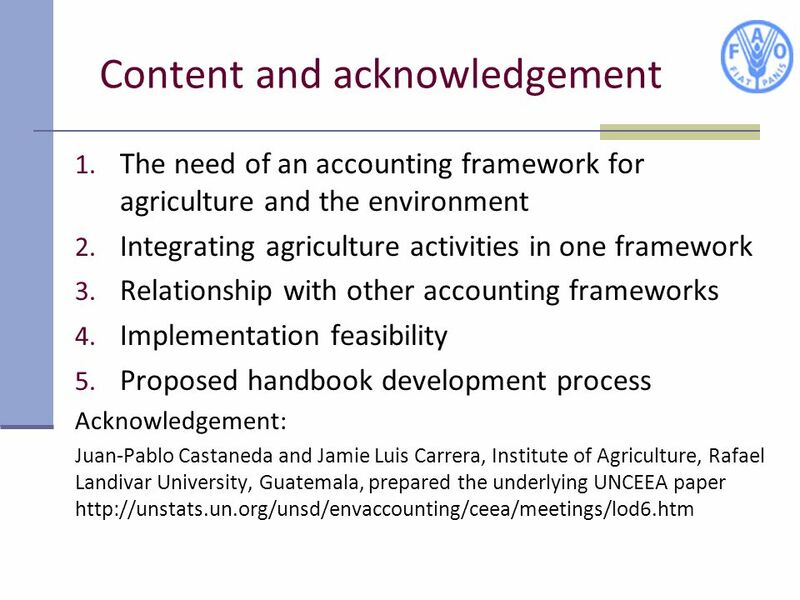 Thus the SEEA-AGRI provides an integrated accounting framework for evaluating and monitoring these activities in their relationship with environmental assets. 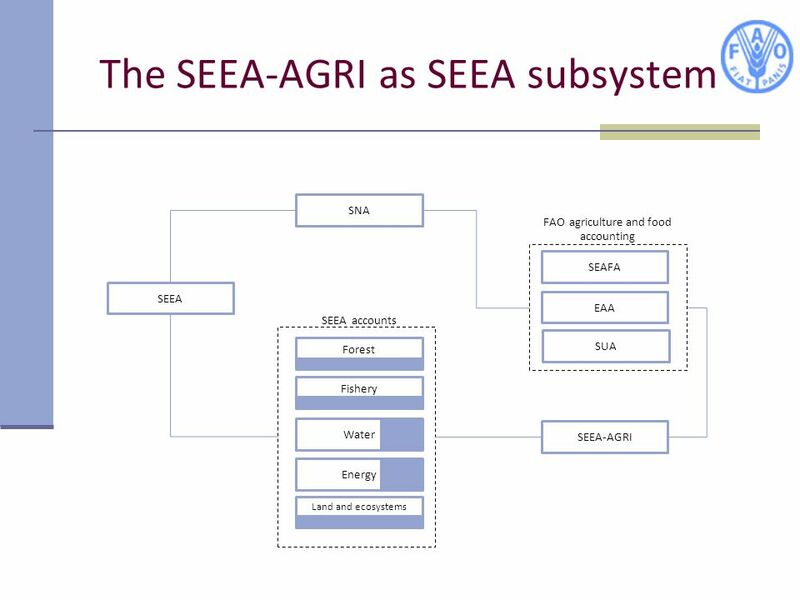 As a result the SEEA-AGRI has the potential to analyse in an integrated way issues such as food security, poverty, biofuels production, informal and rural employment, climate change adaptation, among others..
Download ppt "Robert Mayo, Statistics Division FAO"
System of Environmental-Economic Accounting The System of Environmental- Economic Accounting for Energy (SEEA-Energy) Alessandra Alfieri United Nations. Guidelines on Integrated Economic Statistics United Nations Statistics Division Regional Seminar on Developing a Programme for the Implementation Programme. System of Environmental and Economic Accounts The SEEA 2003 Revision Mark de Haan Statistics Netherlands London Group WIOD Conference Vienna 26 May 2010. Overview of the Global Strategy And achievements G.S. was developed by FAO and the World Bank in collaboration with all key stakeholders. O.de Funded by in cooperation with Expert meeting on biodiversity standards and strategies for sustainable cultivation of biomass for non-food purposes. Copyright 2010, The World Bank Group. All Rights Reserved. Importance and Uses of Agricultural Statistics Section B 1. 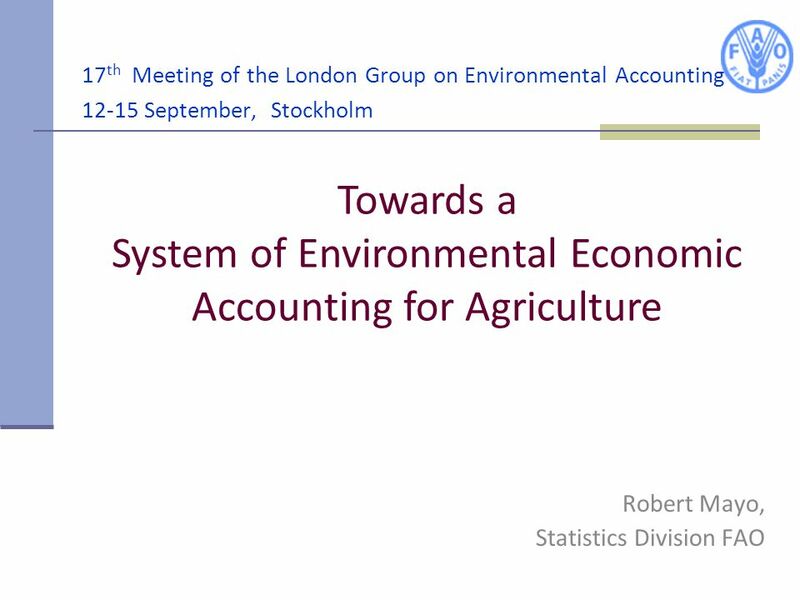 System of Environmental-Economic Accounting for Agriculture (SEEA-AGRI) FAO London Group meeting November, 2013. 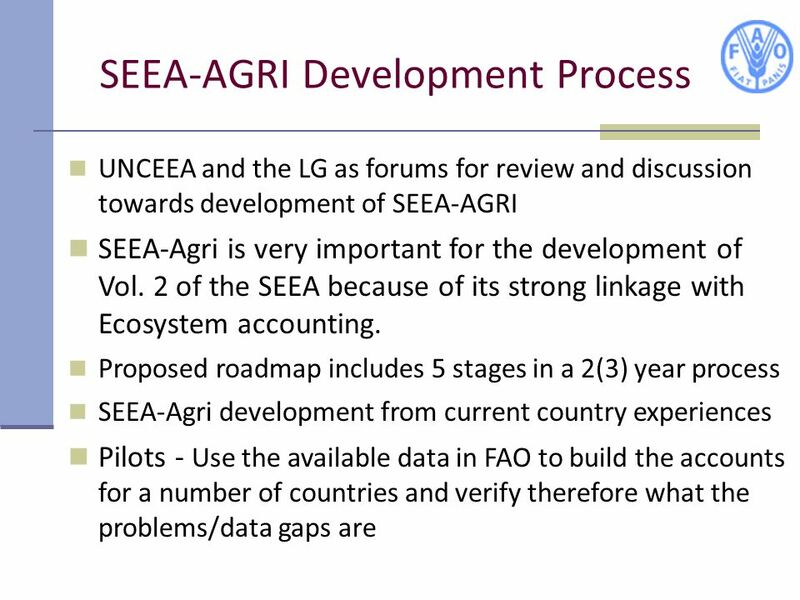 SEEA: A progress report with an emphasis on EGSS Sokol Vako United Nations Statistics Division/DESA. A system’s approach for informing environmental- economic policy Peter Harper Chair United Nations Committee of Experts on Environmental-Economic Accounting. 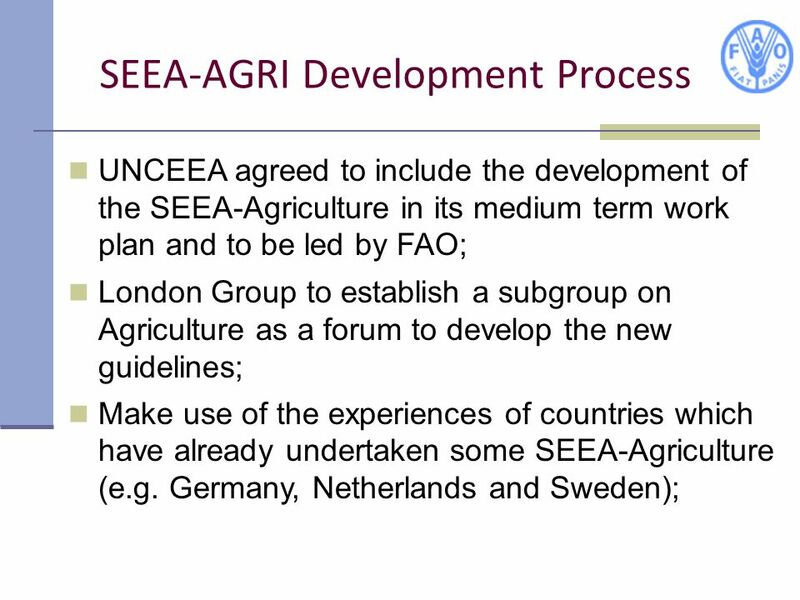 How the SEEA Contributes to Environmental Sustainability Policies Mark de Haan. o update on the status of CPC implementation o other activities: Guidelines on International Classifications for Agricultural Statistics SEEA land classifications. System of Environmental-Economic Accounting Advancing the System of Environmental-Economic Accounting Project (AEEA) Research Agenda Mark Eigenraam Senior. 5 th Meeting of the UNCEEA June 23-25, New York Pablo Munoz and Brad Ewing Harmonizing the National Footprint Accounts with the System of Integrated Environmental. Agricultural Items – Population and Housing Census Questionnaire. System of Environmental- Economic Accounting Working Party on National Accounts (Paris, 25-28 October 2011) Herman Smith United Nations Statistics Division.